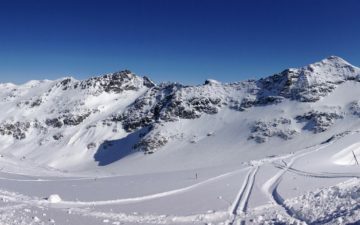 I just wrapped up a really fun review trip. 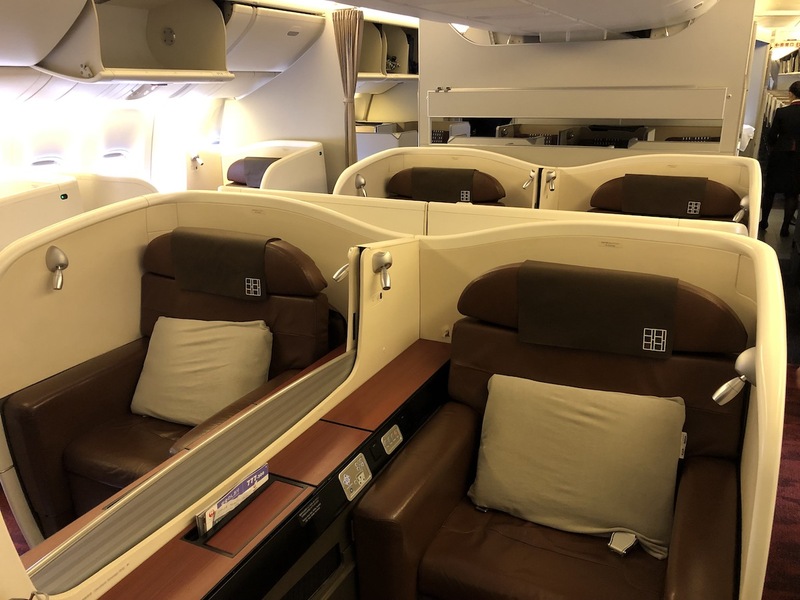 I flew from San Francisco to Melbourne in Qantas’ 787 business class, from Melbourne to Singapore in Singapore’s 777 first class, from Singapore to Kuala Lumpur in Singapore’s A350 business class, and then from Kuala Lumpur to Tokyo Narita in Malaysia’s A350 Business Suite. To finish off the trip I flew Japan Airlines 777 first class from Tokyo Narita to Chicago, which is a ticket I booked for 70,000 Alaska Mileage Plan miles. I’ve flown Japan Airlines first class several times before, though most recently in early 2015, so it has been a while. They’ve made some updates to their service, so I was curious how the product was holding up. 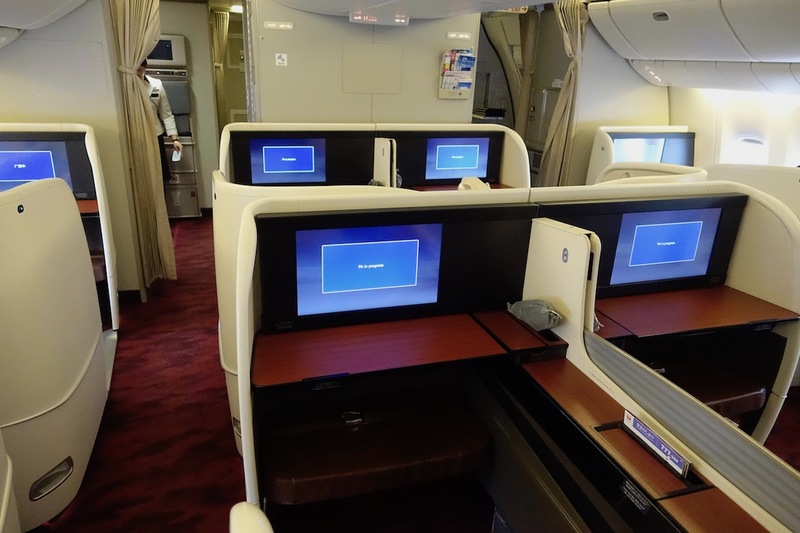 Japan Airlines’ 777 first class cabin consists of a total of eight seats, spread across two rows in a 1-2-1 configuration. The seats are spacious though not as private as some other products out there (though they do have nice privacy partitions along the side). The cabin on this flight was half full, with the four window seats being occupied, and the four center seats being empty, which is pretty ideal. I’d say these are pretty average as far as first class seats go. 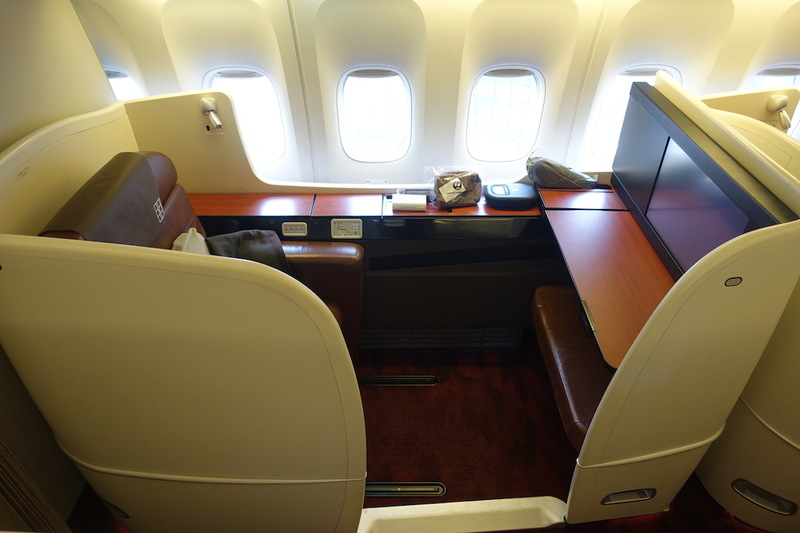 While we’re comparing the two big Japanese carriers, I will say that I prefer JAL’s first class seats to ANA’s. That’s because ANA’s seats are “boxed in” without being fully private, so even if you take the center seats and are seated next to someone, you can’t actually see them without leaning way forward. Similarly, if you’re in a window seat you can’t look outside without leaning way forward. 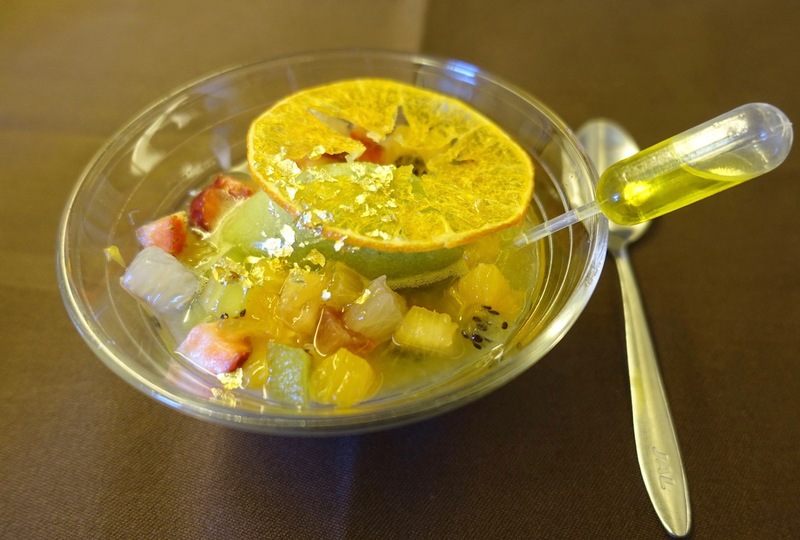 Japan Airlines’ first class catering is spectacular. Lunch was served after takeoff. It started with an amuse bouche. That was followed by a piquillo pepper stuffed with cod brandade. Next up was a serving of caviar. Next up was the warm red king crab and sweet tomato salad, which also had avocado and mozzarella. I have to say, this was the star of the show — I wasn’t expecting it to be amazing, but it was one of the best dishes I’ve ever had on a plane. For the main course I had the grilled rosy seabass “saikyo miso” flavor, which tasted like something I’d expect at Nobu. For dessert there was citrus fruit with herb sorbet, which was surprisingly tasty. 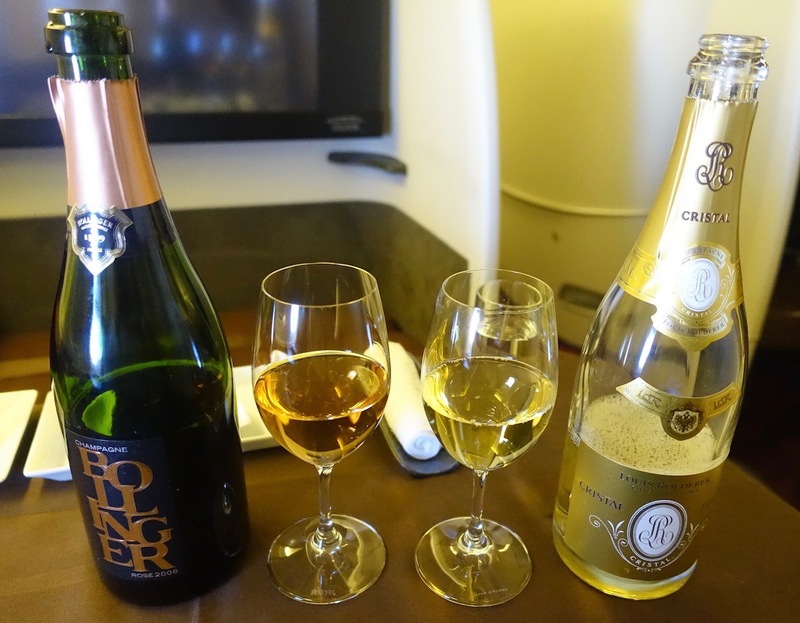 Champagne choices included Cristal 2009 and Bollinger Rose 2006. And while I’ll talk about service below, I just have to point out in this context how good service was. I first drank Cristal and then later had the Bollinger. When the bottle of Bollinger arrived I asked if I could take a picture. Japan Airlines has excellent amenities in first class. 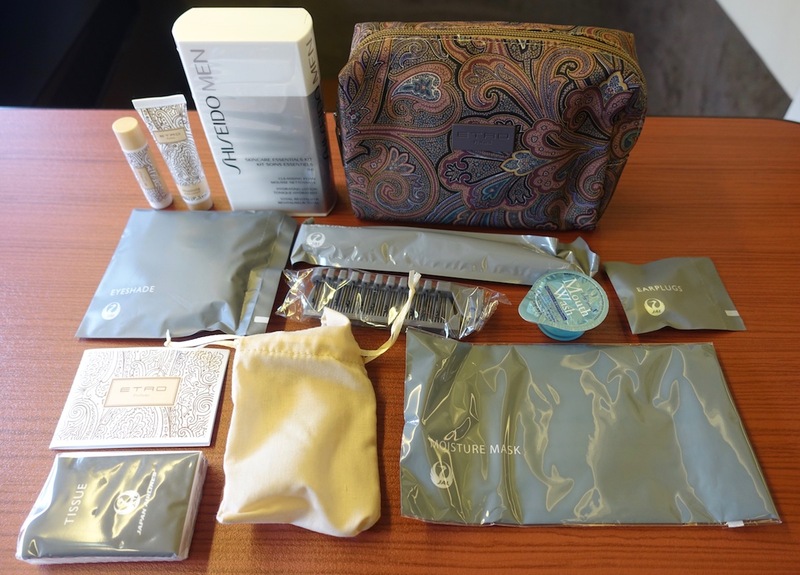 There was a nice amenity kit, which also came with a separate Shiseido skincare kit. Then there were comfortable pajamas. I’m also a fan of Japan Airlines’ bedding. They have nice mattress pads and let you choose whether you prefer a firm or soft one. Japan Airlines has reasonable wifi pricing to begin with (it’s $20 for the entire flight with no data caps), but on top of that first class passengers receive complimentary wifi. I love this, and it makes Japan Airlines one of my two favorite airlines for international wifi, along with Lufthansa. The inflight entertainment otherwise is pretty lackluster, as the selection of movies isn’t huge. Service in Japan is already generally unlike anywhere else in the world. You get amazing service even at a fast food joint. 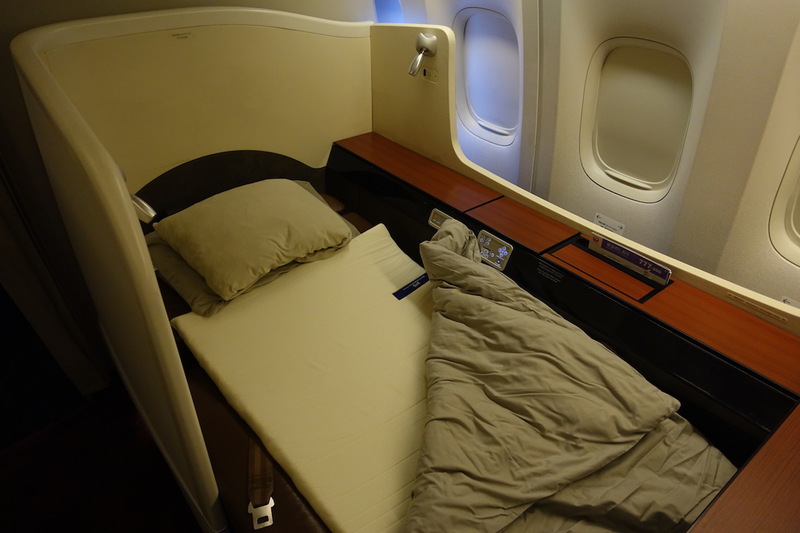 So when you fly first class on a Japanese airline, it’s that times a thousand. This flight had especially good service. In addition to the inflight supervisor and a first class flight attendant, there was also a trainee first class flight attendant. And it was the cutest thing I’ve ever seen. As much as service is usually so precise, gentle, and attentive, this trainee was clearly so nervous yet tried to keep her cool, so watching the pride and purpose with which she did everything was ridiculously adorable. At the end of the flight the inflight service manager and trainee came by my seat to thank me for flying with JAL. I thanked them both, and in particular noted to the inflight service manager how good the trainee was, and it was cute to see how much she appreciated that. I find service on Japanese carriers to generally be good, but this crew was exceptional. Japan Airlines doesn’t have industry leading seats and their entertainment is pretty lackluster, but everything else about the experience they offer is spectacular. Incredible food. Incredible service. Fast, free wifi. Awesome amenities. Japan Airlines really has it (almost) all. I actually think Japan Airlines has my favorite oneworld first class product (yes, even above Cathay Pacific and Qatar Airways). 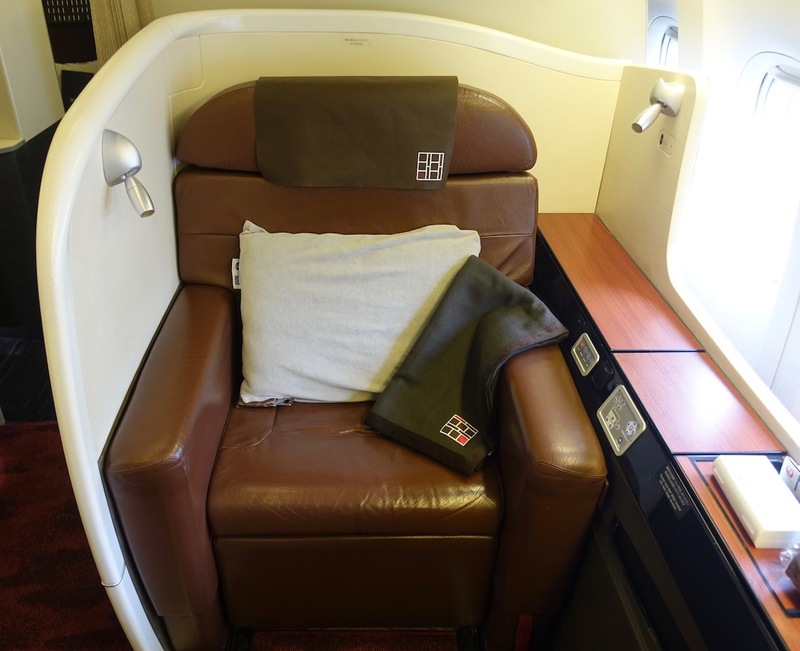 If you’ve flown JAL first class, what was your experience like? Agree 100 percent. I had a delicious Wagyu steak on the same route 10 months ago. Not sure if you are a whiskey fan but the Hibiki 17yr is served in first class as well. It is outstanding and hard to find outside of Japan. They have the best service. It’s not forced like some airlines. The Supervisor on my last flight genuinely engaged me and I was well taken care of. @Lucky my bf and I are taking this flight next month with the same menu. What was the second meal like? JAL first class catering really is in a class above all else. 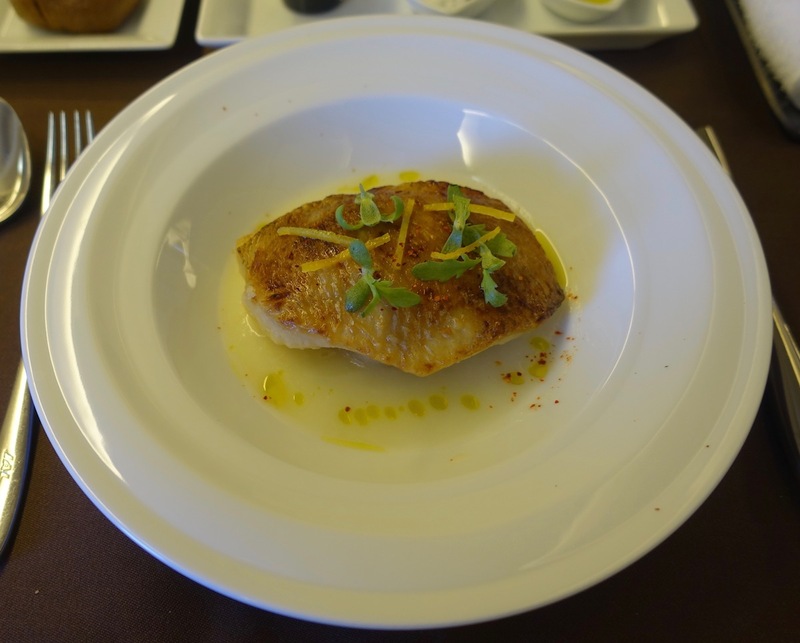 My last HND to SFO was so good I still get hungry when I think about it….and you’re right about the service too, consistently excellent and it start at the airport and right through boarding. I usually would use avios for booking them instead of alaska because it costs less once you factor in the common 30 – 50 percent transfer bonuses that amex and others have. Lucky, you should have asked Tiffany to review this, because JL offers the top notch Cle de Peau amenity kits for ladies, instead of the Shiseido for gentlemen. How was the temperature on the flight? Curious to know from anyone who has flown JAL recently. I hear it’s very regularly warm. Don’t know if I could stand that for 13 hours. 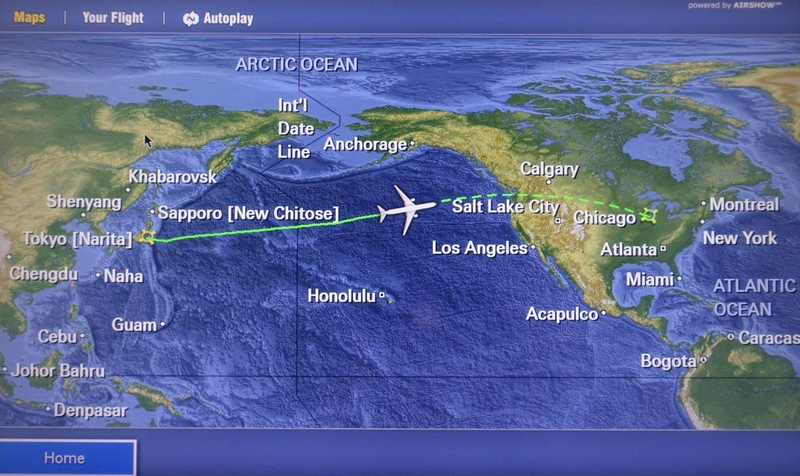 If using Alaska miles to fly to Asia/Australia, would you choose JAL or Cathay? Flew JL F ORD-NRT last month. I almost agree with Ben, although I stop short of preferring JL over CX. The problem with CX is the WiFi and the caviar spoon. But I think I like the CX service style (more “subtle”? less theatrically servile…hard to describe) slightly better. The difference is not big enough to influence me. I can use a metal spoon, or read instead of WhatsApp for 14 hours. However, if we’re talking lounges, no way no how does JL’s First lounge in Narita compare with CX’s The Wing First. No comparison. They had me at bathtub. JAL also has choice two mattress pads: hard and soft. None of the other international FC (to list a few: Etihad, Emirates, Cathay, Korean, Asiana, BA, etc) I tried offers a soft mattress pad. This is also one of main reason why JAL FC is my favorite since I find most pads too hard but I sleep like a baby on JAL. AS has partner specific award charts. The only options for US-Australia are CX and QF. Agree with the poster about lounges. JL lounges even at their homeports are meh while CX lounges at Hong Kong and in Europe are head and shoulders above many other airlines, incl QF F in SYD and MEL. @Lucky, you specifically point out that JAL First is your favorite OneWorld First over Cathay and Qatar… did you mean Qantas? Qatar isn’t really known for an amazing First Class. Flew JAL First once and was extremely excited due to all the amazing reviews. The first appetizer had some kind of pepper in it that made my mouth extremely tingly and weird feeling for the remainder of the flight and ruined the taste of all the food. I was so disappointed. Really looking forward to getting the proper experience next time. Damn, this review is making me not want to fly Cathay First mid next year. Didn’t think I would ever say that lol. The food on JAL always looks spectacular. Can’t wait to read the full review. Fourth Time this year, love them. for me, it’s the only long-haul F product on the planet I’ve personally flown that i’ll rate A+. even ANA / CX / LH / SQ i rate as A. QF/OZ/EY/CA are A-. And this is coming from someone who doesn’t really care much for oneworld. TG is B+ at best. Hibiki 17 & 21 are almost impossible to find even in Japan. I tried looking for either one but even major department stores don’t have one, and crazy price tag prices online. I’m a huge JAL F fan. Was lucky enough to have the whole cabin to myself last August during the solar eclipse (ORD-NRT). Word spread I had the dorky solar eclipse glasses and met pretty much the whole crew on that flight including a co-pilot who came out to chat with me. Same experience with food and service being both phenomenal. On my return the FAs suggested I could eat at my seat (1A) and when I was done they asked if I mind sleeping in 1C as they could make my bed now for whenever I wanted to go to sleep. Folded some origami cranes, and placed it on the pillow, just really awesome. Correction – crazy price tags online. JAL is by far my favourite carrier, not had the opportunity to try F but J is pretty good by any standards. Good seat, mattress pad, excellent food, thoughtful sake and shochu selection. Lovely service. I’d love to try F, but when it comes to more trips or spending the extra miles for F; I’m always going to plump for more trips. Lucky I would love to have seen what the Japanese food selection was like the western looked good enough. I’ve always though JL F was superior to CX F, although it is admittedly close. CX has amazing lounges, and I like the 6-seat cabin on CX. But the food, amenities, and generally service on JL is better, not to mention the free WiFi. When it comes to J, however, JL wins hands down. The product is very comfortable and the service hospitable, but mediocre dining is not comparable to Nobu. I like it more than CX. And the first lounge at HND is next world. I sat at the sushi bar with Hibiki in hand and ate the best sushi I’ve ever had. JAL is great and they release lots of award space last minute (unlike Cathay which has become much less predictable). I like their open layout a lot more than ANA square concept. JAL and ANA have service that is truly extraordinary without having a product that is groundbreaking. It is perhaps more reflective of the culture over any real training. You just can’t train this sort of stuff. I find SE Asian airlines to be overwhelming and a bit too much (I.E, Singapore). Japanese carriers tend to have FA’s that are truly sincere without being over the top. In some ways I wish that US carriers would send people to Japan for training but, as I said, you can’t train this perfection. This comes from generations of understanding respect, graciousness, and courtesy. Back then when JL was still routing their 77Ws to CGK, I hacked out a 30k AS routing for NRT-CGK-NRT-TPE. 14h in JL F, a 2.5h turnaround time at CGK, a 3000 JPY dining voucher at NRT because the outbound flight NRT-CGK was delayed… One of my best value redemptions, beats the old 40k United TG F SYD-BKK any day. Oh please please please tell me you didn’t place your pajamas on the toilet lid for that photo unless those were a sacrificial pair. As you said spectacular food, service, and drinks. It is probably the best catering of any airlines. I have flown them 5 times the last three years, each time catering and service were exceptional. Flew LAX-NRT last year, had few glasses of Salon and it was delicious. 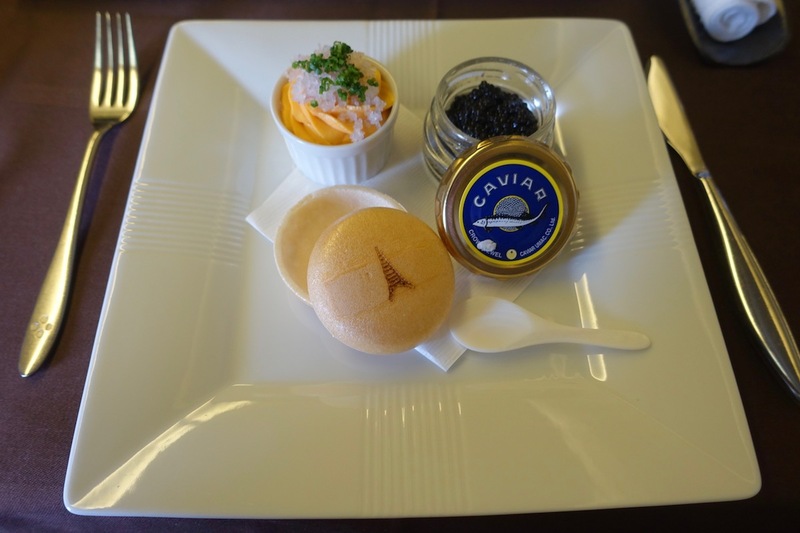 everything else was decent but caviar, it was warm and very fishy….. 2days later flew HND-FRA with ANA and it was text book of how first class food and service should be. To me JAL food and service is step blow ANA. Surely you mean Qantas instead of Qatar as Qatar has a below average first class product and Qantas have better bedding,service,food and seat to Qatar in first class. Also have you changed your mind since writing this detailed article if so should you change it? what is the difference between first and business again? a bigger screen, slightly wider space and maybe better food? for how much more? @lu are you an idiot? What’s the difference between a BMW 3 Series and a 7 Series? Please tell me you tried the Royal Blue Tea? The ANA first class seat is horrible. I was miserable the entire plane ride. If the JAL F cabin is too warm, simply ask them to lower the temperature. Ok, the Royal Blue Tea is awesome. I drank five glasses (I don’t drink alcohol). And Yes, I did love the WiFi on JL. But Enough!!! about the “two mattress pads, soft or hard” that JL offers. Haven’t any of you noticed that actually they only have one type, which has a soft side and if you flip it over, it’s the hard side. Big deal. My spring trip is GMP-HND (stop)-JFK in J for 60K or F for 70K in AS miles. I usually do ANA, but reading this review I am glad I made the choice I did. My wife and I were a bit let down this summer on ANA in first class. How would you compare ANA and JAL? @Lucky – Thanks for this report. Ben, you truly missed out by not having the Japanese meal option. You thought the western food was good? The other one is even better. Perhaps next time! Ben has never ordered a Kaiseki meal on any trip report I’ve read regardless the airline. I agree he’s totally missing out, but I’m pretty sure it’s a set matter of personal preference. If you aren’t an adventurous eater or from a similar culture, many of the dishes are pretty challenging. Japanese menu is the way to go and still get the caviar!!! I love jal f and choose it anytime possible. Food service bed and knowledgeable staff happy to do and share whatever is needed. Bathrooms cleaned after every use. 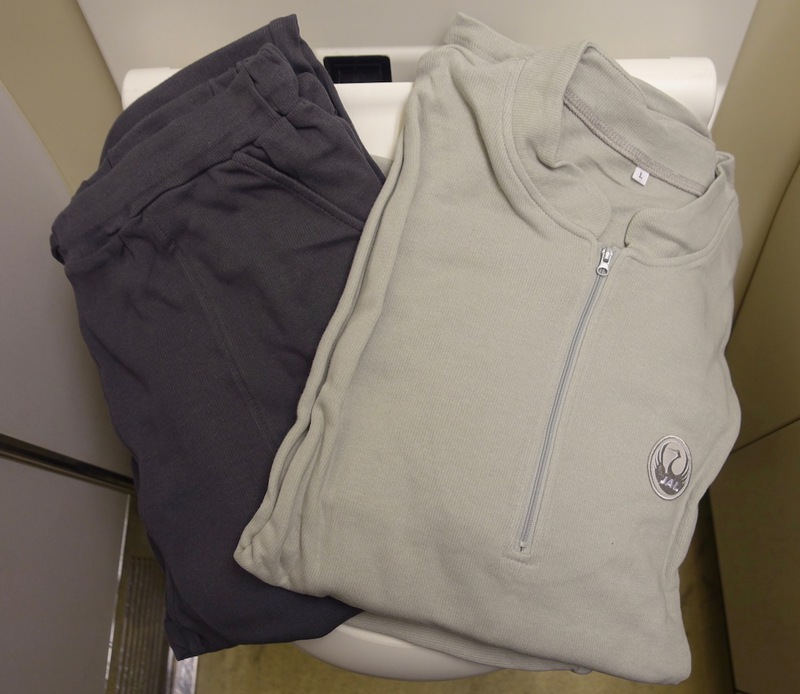 Cloth towels in bathroom. My only wish is for some midnight departures for morning arrival in Asia. The first class sake is insanely good as well. Unrelated – check out AirlineRoute, Etihad is using their 330 for Air Serbia’s JFK route! Exciting! JL F over CX F anyday! @FLD if you were eating sushi you were in the NRT first lounge. It’s tepanyaki at HND. I’ve never see hibiki in the JAL first lounge. I’ll check tomorrow. What’s the point of traveling if you never want to try anything out of your comfort zone, even once? Besides, most people would be delighted to try food by restaurants like RyuGin, Ishikawa and Kohaku. Ha.. a couple of weeks ago I flew in First between HND-LHR and the western menu was exactly the same. For me between JL and CX, I do prefer JL. I think I prefer Cathay f (have only flown each once). Found cx to be more private with the smaller cabin. 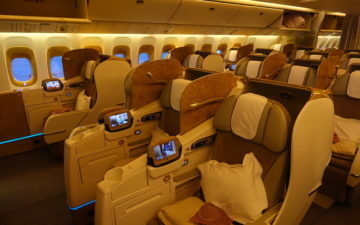 Off topic, I just flew etihad apartments for the first time last night from auh to Sydney. Hands down best flight ive ever had. Loved everything!!! Didn’t find bed hard, nor did I mind the non reclining seat too much (can put feet up on bed/couch). Absolutely loved it. What is the rule of thumb for reward availability on JAL F? How many seats do the release and at what stage? @Burg Nobu is Peruvian Japanese not American. I completely disagree with your assessment of mediocre but believe it or not Ben is entitled to have a different opinion than yours. I went the other way a couple of years ago. I agree that the food and service were excellent. @kunia yes the internet connection was dark for much of my ORD-NRT flight. The weird thing is, the same service (Deutche Telekom) works great on EVA 35/36 YYZ-TPE-YYZ. The route is virtually the same, so I’m guessing the issue is hardware on JL. @Rush I SO agree with you, the decision makers in these outfits are obviously hetero dinosaurs. No variety, just exquisitely pretty women and no eye candy, no flirting for the bent! I was kinda hoping for more details regarding the comfort of the seats, cabin temp (are there air nozzles in the seats),etc.? Did you try the coffee? How was it? @mjonis I have always had the opposite complaint from Lucky: often a cabin is too cold for me, but never is it too hot for me. I don’t miss air nozzles, if they are absent. As for seat comfort, JL was better than CX, because CX has a “lumbar” feature, which depends on air inflation, which is invariably defective. So you press the magic button, thye cushion inflates behind your back and when you release the button, it slowly deflates. In its inevitable, fully deflated position, your back arches deeply into the uncushioned seat. This also affects sleeping. When moved to a non-defective seat, the CX seat is very comfortable. The JL seat doesn’t suffer from this problem, in my experience. I found the JL seat very comfortable. I was surprised by the CX comparison. Something to think about. Since CX has a really nice first class product. CX win for better Lounge. And, better pyjama. And, Aesop. JL HND lounge is very disappointed except the Red Suite. Just got off JL F from JFK, RyuGin is gone. But, still good. The cabin indeed warmer a bit.